Delays the signal by milliseconds. Delays the signal by milliseconds. It's an interpolated delay, the 'D' value can be modulated. 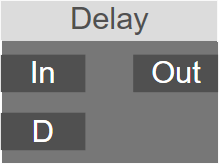 D: Delay length (in milliseconds).